Protect against the effects of acid erosion with Sensodyne Pronamel Toothpaste! This daily anti-cavity fluoride toothpaste helps protect against sensitivity and hardens enamel. - Toothpaste that can actually repair sensitive areas of your teeth. - Contains patented NovaMin technology, which seeks out and forms a tooth-like layer over vulnerable areas of the tooth. We are amongst the reputed organizations, highly engaged in offering an optimum quality range of Sensodyne Toothpaste. Sensodyne Toothpaste is powered by NovaMin and is clinically proven to relieve tooth sensitivity. Being a well-established organization, we are engaged in offering a distinguished range of Sensodyne Toothpaste. 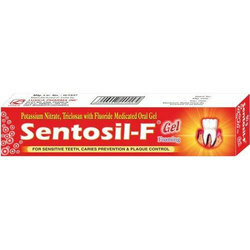 We are manufacturing a wide range of toothpaste which also includes Sensodyne Sachet Toothpastes. These are made by the graded materials with the latest machines. To ensure customers satisfaction, we also manufacture these products in sachet. Banking on our enriched industry experience, we are able to supply Sensodyne Toothpaste. We are engaged in offering Sensodyne Toothpaste.